Every once in a while, Spring time in the Vancouver Lower Mainland surprises you. On a day that was supposed to rain, you get amazing weather. 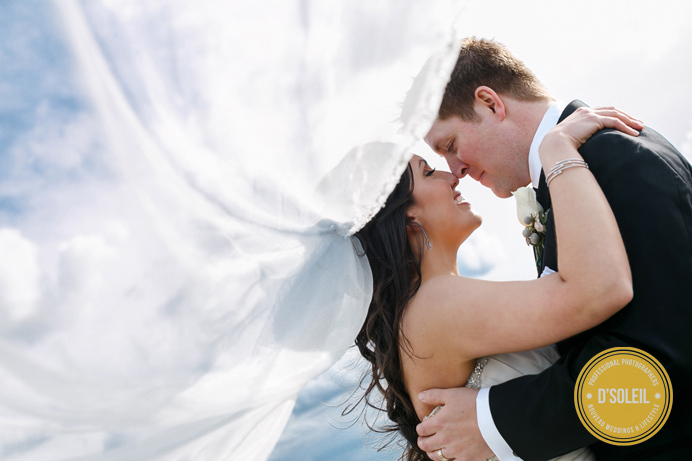 Beautiful cloud-filled skies with warm breaks of sun and winds that make wedding veils look like Angel’s wings. Such was Lisa and Nathan’s Westwood Plateau wedding this Spring. We had plans for photos under cover, but with the beautiful weather that shone down that day, we were blessed to have an opportunity to take photos like this one. Enjoy the preview while we work on the rest. More coming soon from this beautiful wedding. Next Post Cherry Blossom Engagement Session Photos | Rebecca + Andy Vol 1.